This article is about the novel. For the film based on the novel, see Disgrace (film). 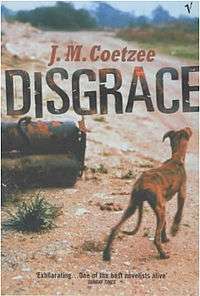 Disgrace is a novel by J. M. Coetzee, published in 1999. It won the Booker Prize. The writer was also awarded the Nobel Prize in Literature four years after its publication. According to Adam Mars-Jones, writing in The Guardian, "[a]ny novel set in post-apartheid South Africa is fated to be read as a political portrait, but the fascination of Disgrace is the way it both encourages and contests such a reading by holding extreme alternatives in tension. Salvation, ruin." In the new South Africa, violence is unleashed in new ways, and Lurie and his daughter become victims, yet the main character is no hero; on the contrary, he commits violence in his own way too. However this violence is clearly seen initially in Lurie's disregard for the feelings of his student. Here is the arrogant white man continuing to treat women, blacks, students, anyone over whom he has power, with contempt. This characterization of violence by both the 'white' and the 'black' man parallels feelings in post-apartheid South Africa where evil does not belong to the 'other' alone. By resisting the relegation of each group into positive and negative poles Coetzee portrays the whole range of human capabilities and emotions. The novel takes its inspiration from South Africa's contemporary social and political conflict, and offers a bleak look at a country in transition. This theme of transition is represented in various forms throughout the novel, in David's loss of authority, loss of sexuality and in the change in power dynamics of groups that were once solely dominate or subordinate. As in all of his mature novels, Coetzee here deals with the theme of exploitation. His favorite approach has been to explore the innocuous-seeming use of another person to fill one's gentler emotional needs. This is a story of both regional and universal significance. The central character is a confusing person, at once an intellectual snob who is contemptuous of others and also a person who commits outrageous mistakes. His story is also local; he is a white South African male in a world where such men no longer hold the power they once did. He is forced to rethink his entire world at an age when he believes he is too old to change and, in fact, should have a right not to. This theme, about the challenges of aging both on an individual and societal level, leads to a line, "No country, this, for old men," an ironic reference to the opening line of the W. B. Yeats poem, "Sailing to Byzantium". Furthermore, Lurie calls his preference for younger women a "right of desire", a quote taken up by South African writer André Brink for his novel "The Rights of Desire". This is Coetzee's second book (after Life and Times of Michael K) where man is broken down almost to nothing before he finds some tiny measure of redemption in his forced acceptance of the realities of life and death. Coetzee has always situated his characters in extreme situations that compel them to explore what it means to be human. Though the novel is sparse in style, it covers a number of topics: personal shame, the subjugation of women, a changing country, and romantic poetry and its allegory and symbolism. Although he devotes hours of each day to his new discipline, he finds its first premise, as enunciated in the Communications 101 handbook, preposterous: 'Human society has created language in order that we may communicate our thoughts, feelings, and intentions to each other.' His own opinion, which he does not air, is that the origins of speech lie in song, and the origins of song in the need to fill out with sound the overlarge and rather empty human soul. A 2006 poll of "literary luminaries" by The Observer newspaper named the work as the "greatest novel of the last 25 years" of British, Irish or Commonwealth origin in years between 1980 and 2005. A film adaptation of Disgrace starring John Malkovich had its world premiere at the Toronto International Film Festival in 2008, where it won the International Critics' Award. ↑ Adam Mars-Jones (1999-11-25). "Guardian review of Disgrace". London: Books.guardian.co.uk. Retrieved 2011-06-06. ↑ the complete review – all rights reserved. "Complete Review of Books". Complete-review.com. Retrieved 2011-06-06. ↑ "Mostly Fiction Review". Mostlyfiction.com. Retrieved 2011-06-06. ↑ "A Moderated Bliss". Issuu.com. 2010-12-07. Retrieved 2011-06-06. ↑ "Salon Books Review". Salon.com. 1999-11-05. Retrieved 2011-06-06. ↑ Coetzee, J.M. (1999). Disgrace. Penguin. pp. 3–4. ISBN 0-670-88731-5. ↑ Robert McCrum (2006-10-09). "The Observer poll of novels". London: Books.guardian.co.uk. Retrieved 2011-06-06. "Postmetaphysical Literature: Reflections on J. M. Coetzee's Disgrace"; in Perspectives on Political Science 33, 1 (Winter 2004), 4–9. "A Moderated Bliss": J. M. Coetzee's 'Disgrace' as Existential Maturation"; in J. M. Coetzee: Critical Perspectives. Edited by Kailash C. Baral. New Delhi: Pencraft, 2008. 161–169. Roy, Pinaki. "Lurie's Lurid Quest: A Brief Re-reading of J.M. Coetzee's Disgrace". Gender and Commonwealth Studies (ISBN 978-93-5225-029-5). Eds. Kunda, A., and A. Bhattacharyya. Kolkata: Books Way, 2015. pp. 21–30.